This is a bad movie. This is a very, very bad movie. This is also a movie that I had never had any plans of watching. In steps Jason Wineinger. Jason: "Oh hey guys I have this great movie. We'll watch it and have a great time because it's so great." God dammit, Wineinger. Seriously this movie is an abomination which is why we had to watch it with Rifftrax because otherwise the film itself would have been unbearable. Visual Effects jump off the screen awkwardly before the shot is even over, the same shots of digital birds are looped over and over. 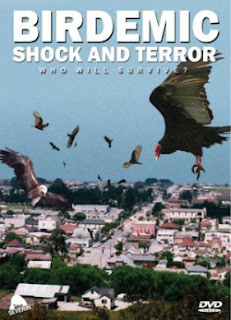 Hell, the only real birds in this film are there by accident. There are some scenes that you can barely hear because the audio is so bad. The list just goes on and on and actually makes me appreciate The Room for at least having the courtesy of being aesthetically competent. One of the first thoughts I had (other than 'Damn you, Jason') was that there is no way this film had post-production. There are so many aspects that are easily fixed by just being behind the computer in Final Cut Pro for the weekend. Yet they didn't even bother to do that! Instead there's just a movie that feels half finished. Actually, no, even that gives this film too much credit; this movie feels like it's .001% complete and this is just a collection of dailies, never meant to be shown to the public. What baffles me even further is that this movie is getting a sequel. Not only that but it's going to be in 3D! I've seen what this masterful filmmaker (*vomit*) can do with the most basic technology so the logical next step in giving him even more complex tech to deal with? This smells like a recipe for perfection. I can almost guarantee I'll watch the sequel but dammit I'm not going to like it.